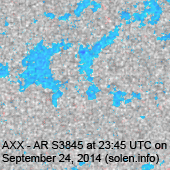 Last major update issued on September 26, 2014 at 05:20 UTC. 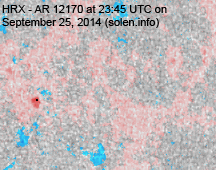 The geomagnetic field was quiet to active on September 25. 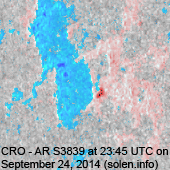 Solar wind speed at SOHO ranged between 427 and 508 km/s under the influence of a high speed stream from CH636. 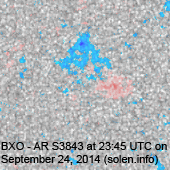 Solar flux at 20h UTC on 2.8 GHz was 158 (increasing 38.1 over the last solar rotation). 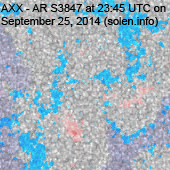 The 90 day 10.7 flux at 1 AU was 136.8. 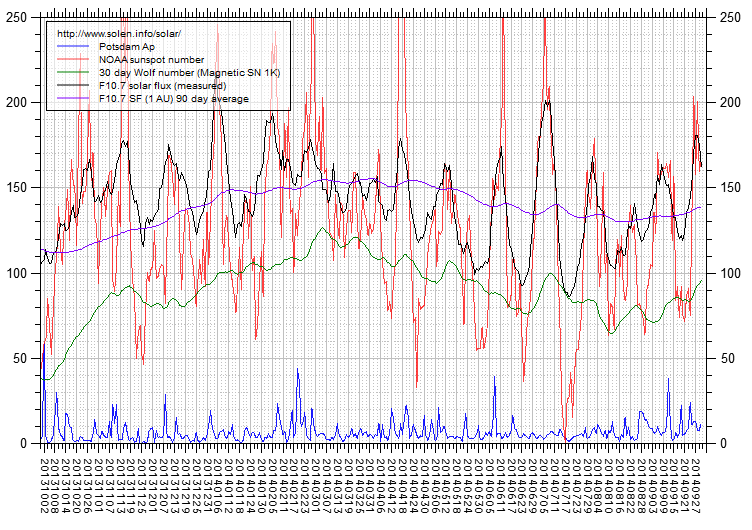 The Potsdam WDC planetary A index was 11 (STAR Ap - based on the mean of three hour interval ap indices: 10.8). 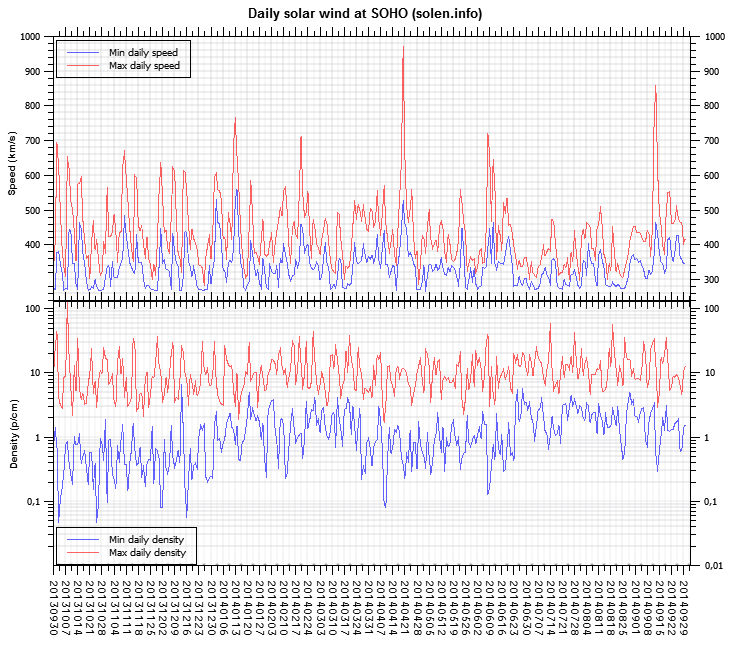 Three hour interval K indices: 42232123 (planetary), 43423324 (Boulder). 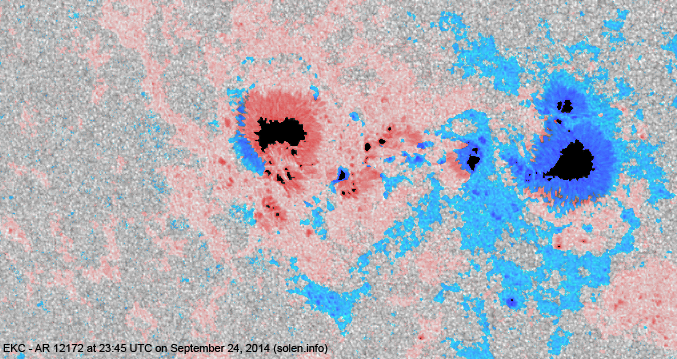 At the time of counting spots (see image time), spots were observed in 11 active regions using 2K resolution (SN: 306) and 11 active regions using 1K resolution (SN: 230) SDO images on the visible solar disk. 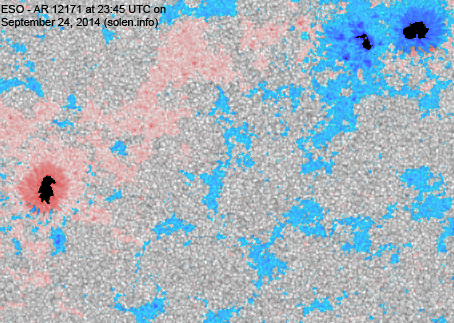 Region 12170 [N10W38] decayed further and could soon become spotless. 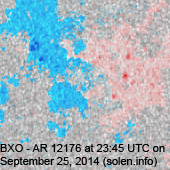 Region 12171 [S12W11] developed in the trailing spot section as new flux emerged. The new spots could be a region by itself. 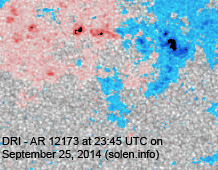 Region 12172 [S11E12] displayed no major changes and still has a weak magnetic delta structure in a central penumbra. M class flares are possible. 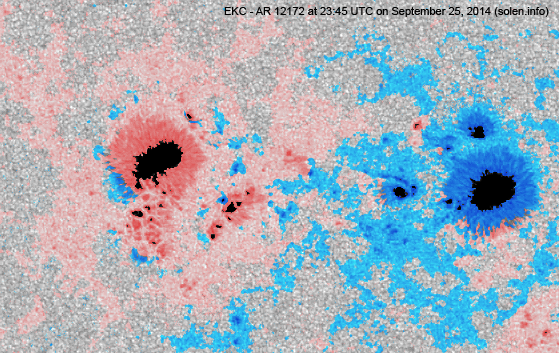 Region 12173 [S16E02] reformed with new flux emerging quickly. 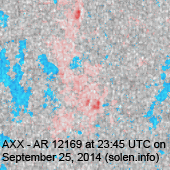 New region 12175 [N14W11] was first observed with spots on September 21 with SWPC numbering the region 4 days later. 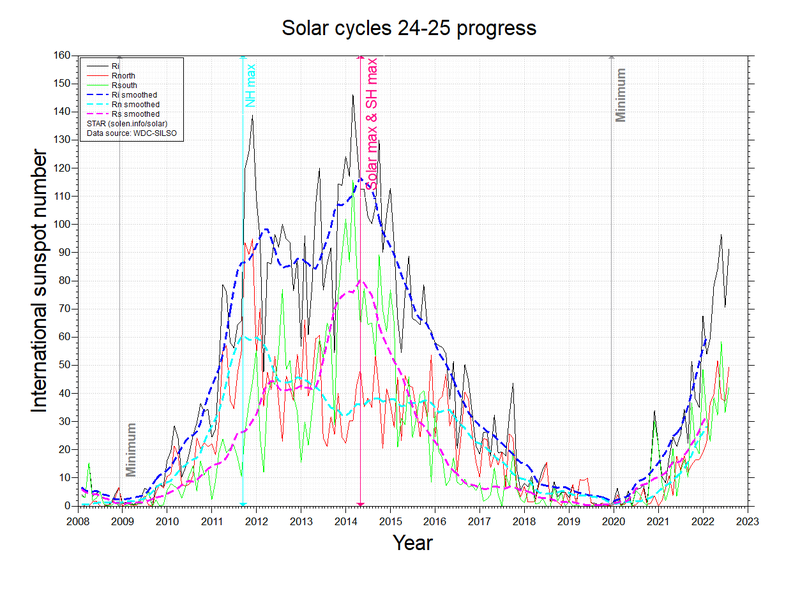 Quick growth started on September 24 and continued the next day with a small magnetic delta structure forming in a trailing penumbra. The magnetic layout of the region suggests that this is actually two closely spaced regions with the smallest region in the north. 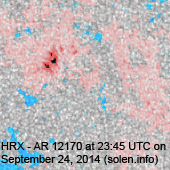 New region 12176 [N07E44] rotated into view on September 22 and was numbered by SWPC 3 days later. 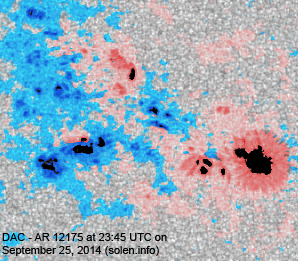 New region 12177 [N12E80] rotated into view and may be capable of M class flaring. 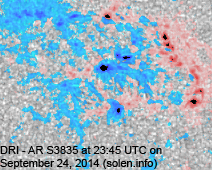 S3837 [N15W26] reemerged with a penumbra spot. 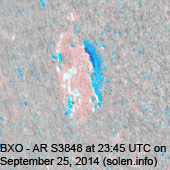 New region S3847 [N01W22] emerged with a penumbra spot. 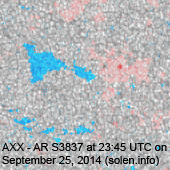 New region S3848 [S13E66] emerged with penumbra spots. 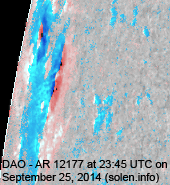 September 23-25: No obviously Earth directed CMEs were observed in LASCO and STEREO imagery. 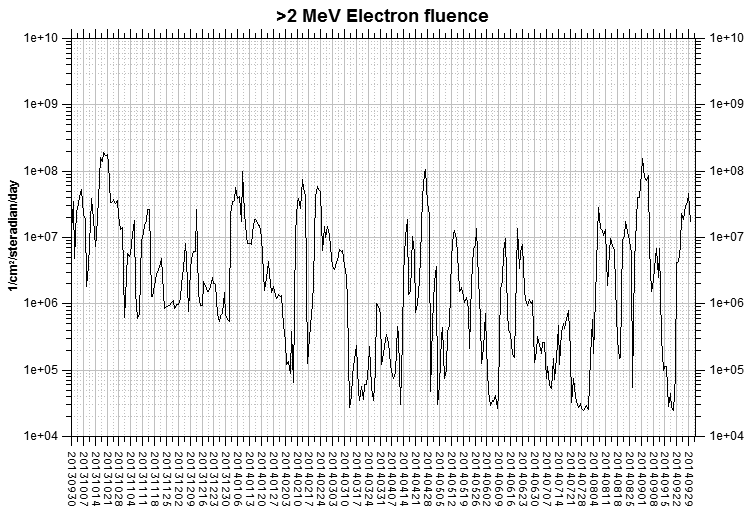 A large backsided northern hemisphere CME was observed late on September 24, this CME was associated with a minor enhancement in proton levels. 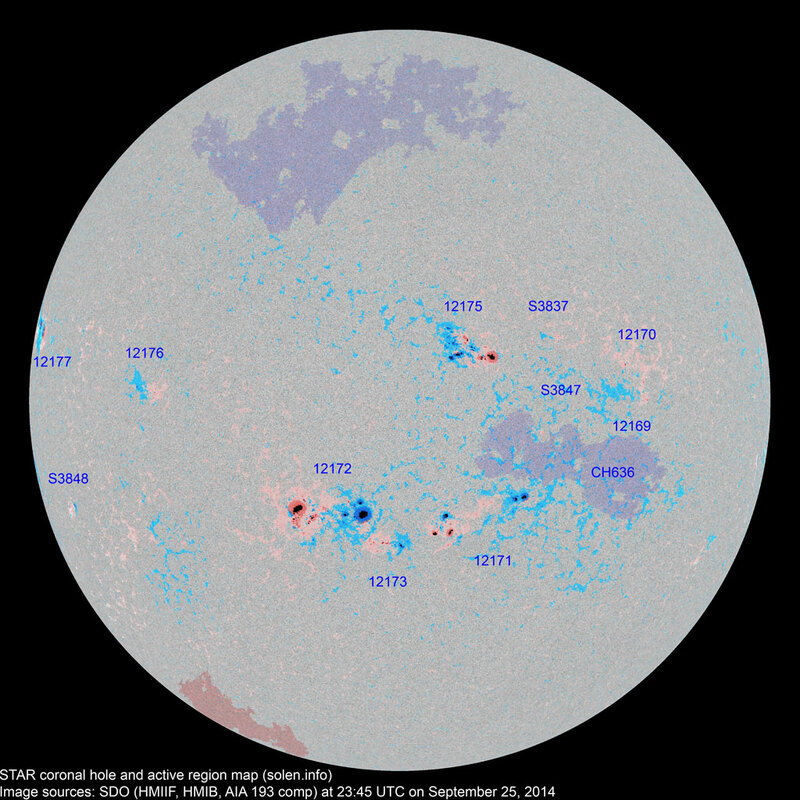 The geomagnetic field is expected to be quiet to unsettled with a chance of active intervals on September 26-28 due to coronal hole effects.